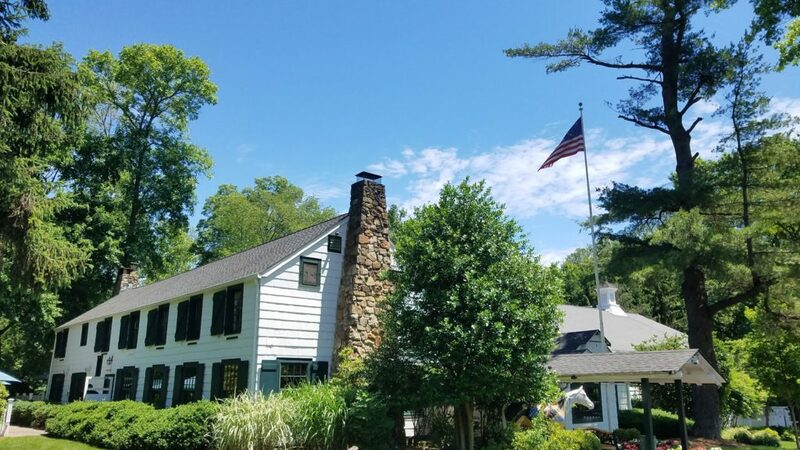 Before I begin this post, I have to say that this topic was one of my favorites with June Kennedy, our Basking Ridge Town Historian who recently passed in November 2018. 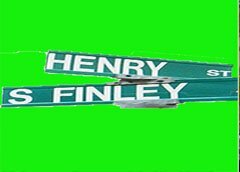 We often challenged each other to dig the truth on the naming of all the 463 streets. 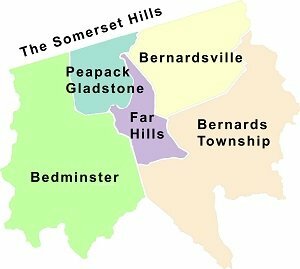 The streets covered include the hamlets of Basking Ridge, Lyons, Liberty Corner, and West Millington which makes up Bernards Township. 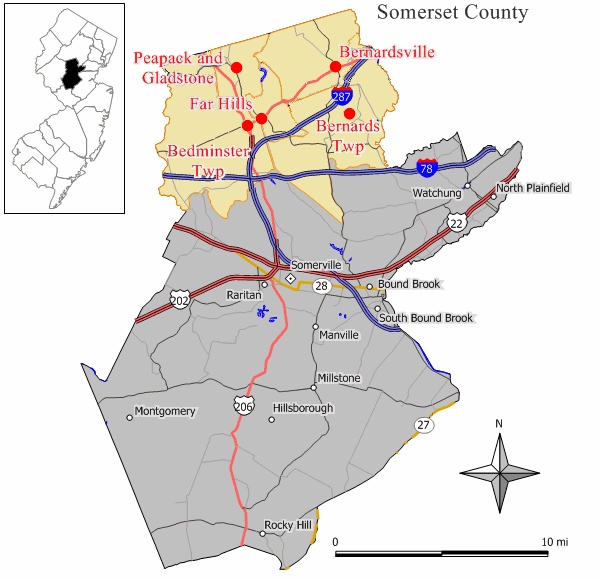 June Kennedy had been involved with history as soon as she moved to town from Little Silver, New Jersey. During the “boom boom” build years in Bernards Township starting in the 1960’s, she became increasingly frustrated at developers who were building in the township and naming streets after their sons, daughters, golf clubs and whatever else. So she got involved. Based on discussions with June, she named over 40 streets as historian and was an advisor to David Schley and the Bernards Township Engineering Department up until five years ago. 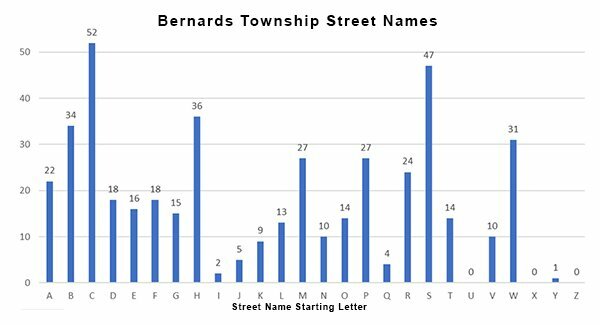 A strange metric, but people asked to know the starting letter of the most streets. From our analysis, C, S, and W took honors. Our next metric focuses on a key set of categories that June and I agreed. It’s great to know that the town certainly ties back to its roots with Area Features, Local Residents, and England taking the top three categories. Our next “Street Name” metric focused on a set of categories. 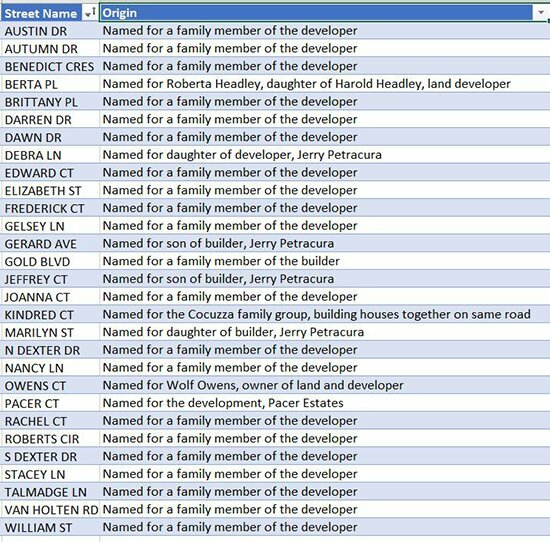 The next category breakdown we targeted was local names of town residents. If you’ve ever wondered who that street is named after and what is the significance, here’s your chance to learn some great local history. You can click the image below to enlarge it. Local Names of residents where streets were named after. Click the image to enlarge and review. This was the category where June Kennedy finally put her foot down. For a number of years starting in the 1960’s, development increased at a feverous pace. Without June, the street names were permitted to be named by the Developer. So what did they do? Then typically named the street after a family member, usually a spouse or children. So is your street named after a developers relative? Thanks for taking a look at our street names presentation. I shared it at the local historical society back in 2017. I hope to present the presentation and topic again in the future. Below is the list of every street name we knew as of 2016. Enjoy the list.